There are many new journals coming online each day, and it’s hard to know which ones will make it and which won’t (although if you are wondering whether a new journal is considered ‘predatory’ in the sense that they will take your money without investing much effort in your paper, there’s a good list here). For the time being, I have been making the decision based on: 1) discussions with colleagues, 2) the publisher and/or partner, 3) the track record of other projects from the group, and 4) the editors. F1000Research has also just announced a new campaign, with an offer for authors of ecology papers: No article processing charge on the first ecology paper you publish with F1000Research until the end of December 2013 (using code ECOL16). This can be on standard research reports, but also on articles that replicate previous datasets, pure data articles and null/negative results. They are also introducing a new category of article, called an ‘Observation article’, which reports serendipitous observations that have not been studied systematically, but that offer a starting point for further exploration. I for one will be watching this journal with great expectation, and would love to hear from anyone who has published there. And the reviews are in…. I really enjoy reading Rosie Redfield’s blog: RRResearch, not least because she’s come up with the brilliant idea of posting the reviews (and her responses) for manuscripts she is publishing. There are a few new journals, such as Faculty of 1000, that are posting the reviews with the manuscripts online. But mostly, the hours and hours of time that go into both writing a review and responding to reviews are only treated as a means to an end- the publication. Given that journal space is at a premium, however, there are often important points that come up during these back-and-forths that don’t make it into the manuscript for one reason or another. Therefore, I am going to follow in Rosie’s footsteps and post reviews of each manuscript once the papers are published (so that readers can understand what the reviewers were talking about!) As a start, here are the reviews and my responses to my new paper in Current Biology. Overall, I thought the referees did a great job. They were tough on me, and made me think very deeply about whether or not to sequence all of my bacterial isolates. In the end, I decided that knowing what species I was dealing with would only confuse matters, as I argue below. The world is complicated, but we have to start somewhere! *Please note that I have excluded all “minor” comments. Advisor I. In principle, a study that looks at coevolution among bacteria and phages in nature (especially within one host species) would be a very exciting development. It seems that the author is addressing both whether bacteria at a certain time point are best adapted to phage from their past and whether phage are best adapted to bacteria from their past. If we knew that each group (i.e., phage or bacteria) represented a single lineage and that the evolutionary changes within each involved a response to the other, this would be coevolution. However, it seems that the study by Britt Koskella is much more diffuse, where we are not sure if we are looking at a given pair of bacteria and phage populations over time. It seems that there could be a great deal of bacterial species sorting involved here, possibly based on actions of the phage and vice versa. Response: This is a key point in the paper, and I have now worked to emphasize that the pattern observed is likely a combination of immigration/succession and evolutionary change. In addition, I discuss the likelihood that the observed pattern represents diffuse coevolution. However, the directionality of the pattern observed (that bacteria are most resistant to phages from the past and least resistant to phages from the future) suggests that the bacterial communities are changing in response to the phage and that the phages are then responding to these changes. However, the directionality of the pattern observed (that bacteria are most resistant to phages from the past and least resistant to phages from the future) suggests that the bacterial communities are changing in response to the phage and that the phages are then responding to these changes. The evolutionary response could be driven by immigration of newly resistant/infective types or species (indeed, this is likely a key evolutionary force in these systems), but the pattern clearly does not represent simple species sorting, as this should not lead to the directional change observed. Instead, if new bacterial species were arriving and were facing a competitive advantage due to resistance against local phages, and then new phages were arriving that were able to infect these hosts, we would expect either a peak or a trough (depending on which player was ahead in the coevolutionary race) in resistance at the contemporary time point. The power of these time shift approaches in examining coevolution has been specifically discussed here: Gaba, Sabrina, and Dieter Ebert. “Time-shift experiments as a tool to study antagonistic coevolution.” Trends in ecology & evolution 24.4 (2009): 226-232. Advisor II. The author does not really know if she sampled the same species/population. The resolution is too low to make this claim and apparently no attempts were done to give convincing arguments. Without making sure that the same populations was sampled several times in time, the study is not convincing. If different populations were sampled the observed patterns have a different meaning. Response: As mentioned above, I agree that this is both a limitation of the study and also (I think) the strength of the study. We know, based on a myriad of pairwise bacteria-phage experiments in the laboratory, that phages and bacteria can coevolve. However, whether this means they do so under natural settings, given the complexity of all microbial communities examined to date – especially microbiomes – is unclear. My previous work demonstrates that phages are just as infective to bacterial hosts from leaves in other parts of the tree canopy than they are to hosts from the same leaf, but that phages perform poorly on bacterial hosts from leaves of a neighboring tree. This consistent pattern (observed across all eight trees) was my motivation for sampling leaves of the same branch of each tree over the course of the season. It is highly probable that the bacterial community changed dramatically over the season (this is common of most bacterial communities), but the results of this study suggest that the phages are playing a role in this change – as the pattern of resistance to past, present and future phages is directional, rather than highest/lowest for contemporary combinations as would be predicted if this were simply local adaptation across populations/communities that were acting as independent units. I have now worked to emphasize these points in the manuscript. Response: The main result (that bacterial resistance depends on whether the phage is from the month prior, same month or future month) has a P-value of 0.008 using a non-parametric test and is robust both to inclusion of the tree with complete resistance and the removal of the tree with a very strong negative slope. These results are now discussed. Response: As mentioned above, this has now been taken into account in the revision. As I discuss in more detail below, I am hesitant to sequence the bacterial isolates as (a) the study was designed to examine phenotypic change and therefore the sampling was not exhaustive of the bacterial diversity (which would have required the examination of many fewer tree communities but more isolates), and (b) bacterial species identification is not likely to offer additional information, as resistance can be acquired very quickly under laboratory conditions and thus two genetically unrelated species of bacteria may well share a phage antagonist and therefore follow similar evolutionary responses to phage-mediated selection. To tease apart these possibilities, a very different sampling approach would need to be used and sequencing of multiple loci per isolate would be required (as mentioned by the reviewer below). However, I thank the reviewer for emphasizing that the observed patterns could be explained by multiple levels/mechanisms of coevolution and I have kept this in mind during the revision. Reviewer I: This paper addresses coevolution of bacteria and phage within a group of horse chestnut trees in a small area. This is an interesting application of the new method of time-shift experiments, where one can test whether a host becomes resistant to a given pathogen over time and whether a pathogen becomes more capable of infecting a given host species over time. The results are entirely consistent with a given bacterial species becoming more resistant to a lineage of phage, as well as a given lineage of phage becoming more able to infect a given lineage of host bacteria. If this conclusion could be nailed down better, I would see this as an extremely important contribution to bacteria-phage evolutionary dynamics and more generally to microbial coevolution. The catch here is that there is little evidence in the present paper for a continuity of bacteria-phage interactions over time. It is not clear that the phage from the past (for whom the bacteria are extremely resistant) are from the same phage lineages as those from the present. This strikes me as essential for the author’s arguments. As the author acknowledges, this could be a diffuse coevolution where there is no arms race going on between any pair of organisms that co-persist at the study site. It is important that (as far as I can tell), time-shift experiments up to now have focused on a given host species and its pathogens, which makes it easier to see co-evolution between focus organisms. It seems to me that the paper would be much stronger if the author were to tighten up the evidence that co-evolution is occurring between a given host species and its phage. This could be demonstrated for the 2-3 most abundant bacterial species over time, as well as for the 2-3 most abundant phage lineages over time. If the time-shift patterns seen for the whole community hold up for a given taxon or two, I’d be much more convinced. I should mention that I think the whole-community results are extremely interesting; I just think they need to be supported by carefully demonstrated co-evolution for a couple of bacterial species and their phage. So, I’d like to see the author sequence the bacterial isolates for 16S, stratify the analysis by bacterial species, identify the predominant phage lineages (not as easy), and see how the time-shift holds up for pairs of host and pathogen. Response: I thank the reviewer both for their interest in the results and their comments regarding community-level change. Work in which particular phages and bacteria have been co-cultured in a test tube in the lab have repeatedly demonstrated that coevolution can occur. What I wanted to test here was whether coevolution does occur, given the complexity of the natural environment and the potentially high rate of immigration into the leaf. I have now worked to make clear throughout the manuscript that the results are likely a combination of population and community-level processes, but that the directionality of the data suggest that phages are playing a role in shaping changes in the microbial composition of leaves over time. More broadly, I have also steered the focus away from coevolution per se and more to the selective role of each player in shaping the evolution (which of course includes immigration) of the other. It is true that the data are not necessarily specific to an interactions between two consecutive lineages, and indeed this is a drawback of all natural studies that include immigration. Demonstrating this would require the use of marked strains released into the tree environment, although would take away from much of the interesting natural history and complexity. One could also sequence all of the isolates, although this would only demonstrate that two isolates are the same species and not that one is derived from the other (given the possibility of immigration). Although this approach would allow me to determine whether the bacterial community was changing over time, and whether common bacterial species were being specifically targeted by phages, it would therefore not provide additional information regarding whether a given phage lineage was coevolving with a given bacterial lineage. This is true for two reasons: first, because the phages in the horse chestnut phyllosphere can have remarkably broad host ranges, even infecting bacteria across genera (see Koskella and Meaden. 2013. Understanding Bacteriophage Specificity in Natural Microbial Communities. Viruses 5: 806-823); and also because two bacterial isolates from different time points may well be from independent lineages despite being identified as the same species due to immigration. Thus, even if I could identify the bacterial hosts, I could not directly assign a given phage lineage to this host (and indeed the same phage lineage could mutate to broader host range), nor could I clearly link a bacterial isolate from one time point to another. Thus, for the added cost and work involved in sequencing the bacteria and phage isolates I am quite convinced that there would be little if any additional insight gleaned. Again, I think the idea of focusing on a few common bacterial and phage lineages is good and could yield additional insight to the process, but feel this approach falls outside the scope of this paper and indeed would have required a quite different sampling design, where for example a single tree was followed in great detail over time. This is indeed the plan for a new grant proposal where funding for sequencing is requested. Response: I thank the reviewer for their positive comments regarding the novelty of the work and the implications of the data. I appreciate the concern regarding the inability to distinguish phage-mediated selection and reciprocal bacterial-mediated selection at the population versus community level, and the possibility that phages are acting to shape the success of new bacterial immigrants and vice versa. I believe both processes are likely, and I agree that the data were not designed to differentiate between the two processes. Rather, the work was designed to measure whether the phages present in the phyllosphere are playing a significant role in shaping bacterial evolution (including the success of immigrants, as migration is a key mechanism of evolution). The directionality of bacterial resistance to phages from the past, present and future suggest that this is so, and makes a strong case for further examining the nature of coevolution within this, and other host-associated microbial communities. I have now worked to emphasize the major aims of the study and to discuss the possible role of immigration and species turnover in shaping the observed pattern. I have also changed the title, as suggested. Reviewer III: This study investigates temporal adaptation in bacteria-phage coevolution within horse chestnut trees. I think this is an interesting and straightforward study that merits publication in Current Biology given that it reports considerable advance on previous understanding of bacteria-phage coevolution. Methods and testing sound robust, results obtained as well. Given that a reconstruction was made based on natural populations in the field, the study extrapolates results so far been tested based on laboratory experimental coevolution only. Response: I thank the reviewer for their support and interest in the study. My only minor comment is that often the author speaks about microbial communities, but that there is no indication of how diverse these communities are (e.g. with respect to OTUs present, would it be possible to characterize those e.g. via pyrosequencing ?). Response: My previous work has gone some way in characterizing the culturable microbial diversity observed at the end of the season (and I have now discussed this in more detail) but no work has yet been done on assessing diversity at the culture-independent community level. However, there is evidence that leaf-associated microbial communities rank among the environments in large proportion of bacteria are culturable, and this is now discussed. 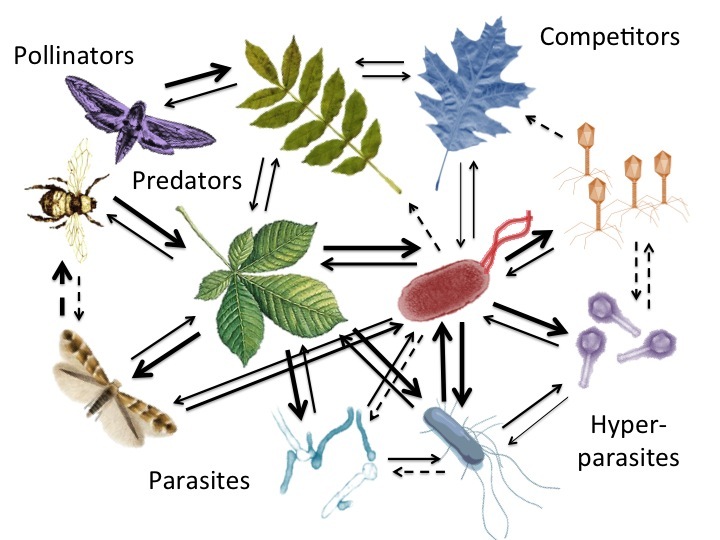 I have also discussed the few other studies that have examined microbial dynamics in the phyllosphere to emphasize the heterogeneity of these communities.